Alex McKay is a landowner whose farm property is crossed by the Avon Trail as one moves from Embro Road (aka Perth 113) northeast in a meandering direction that follows Trout Creek. 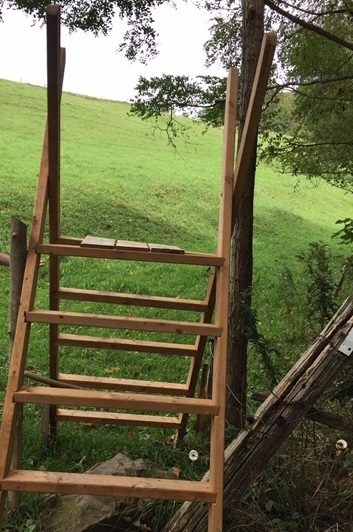 The trail leads to a stile that leads to one of the farm’s pastures. Continue east, cross a farm steel slab bridge, and then cross another stile to enter the next pasture. Continue north east for another kilometre and you enter the Periwinkle Trail. It is one of the oldest re-forested woodlots dating from 1905. The scenery in the spring is spectacular, with periwinkle blooms visible all around. McKay has been on his 100-acre farm for more than 30 years. Before that, the property was operated by his uncle. Access for the Avon Trail to traverse the land was granted sometime before Alex’s time on the farm. And having hikers come by is fine with him. McKay said that he likes the idea of people getting out and seeing the country, seeing a farm from the inside, not from the road. He continued, “I like to have people look at the land and the cattle we have just as long as they don’t interfere and frighten the animals”. Hard as it is to tell now in the grip of winter with snow blanketing the fields, the terrain will change with the seasons. The pastures will return to their lush green coverings, with cows dotting the landscape. Farming is a full-time occupation for McKay, with no seasonal breaks. “The animals need to be fed no matter what the season”, he said. Although he is not an Avon Trail hiker himself, Alex does walk throughout his property frequently and has never found any garbage left behind by users of the Avon Trail. Thank you, Alex McKay. We members of the Avon Trail will continue to respect your farm land and animals, enjoying the view and walking experience, seeing the farm from the inside.